Before I start any significant stained glass piece I ask myself “would I be able to do justice with my stained glass abilities, to this life form that I witnessed when I was out walking, or saw a picture of in a nature book?” Usually this is a sea creature, insect, or plant that I can picture rendering with the already vibrant colors of the sheets of glass and with vein patterns that would flow well with solder joints, and enjoy using glass powder frit techniques to get finer details on its small parts. Having mentored under the renowned Harold Makepeace who got me to notice light formations, and residing at his Spiral Shop Gallery in Vermont, provided me with literally a garden full of inspiration. 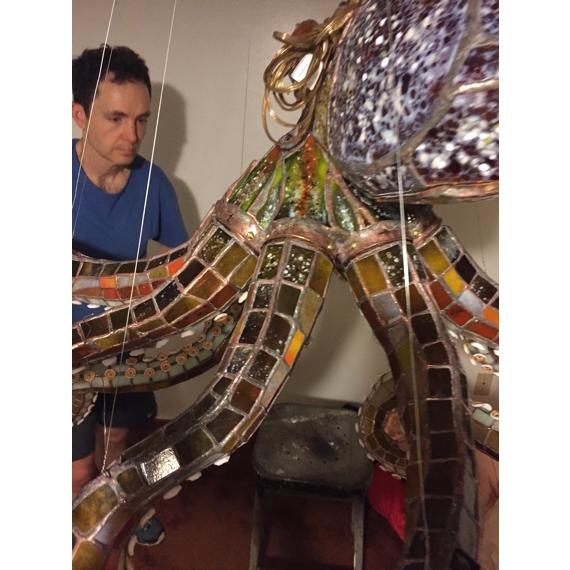 Other times my inspiration is a life form that would make a good functional piece, such as an octopus made into chandelier. This serves to make nature accessable without having to travel to a natural history museum or aquarium, and for practical purposes, immortal too. I proceed to scrutinize pictures and sometimes anotomical information of the actual creature. Then I design a pattern that is big enough to get details but small enough to be practical for home décor. And as I am sure architect Antonio Gaudi found out too, to design and execute something assymetrical is both as difficult as it is rewarding, which is exactly my experience with putting in the extra effort to make an octopus look how you’d find it in nature. Each of their differently posed arms take shape as they go, but I also have to make sure I pose them so they won’t run into and block each other when I assemble them all onto its head. I know when a piece has succeeded when people look at photos of it and say “That’s made of glass? I thought that was the REAL butterfly.” or “It looks like it’s swimming in the ocean”. I have even seen bees wondering if my glass flowers are real. I also am a prolific watercolor and pastel artist, specializing in landscapes and cityscapes of Massachusetts, Vermont, and Oregon. You can see these at their own website.